Thought-provoking and even controversial. . . It looks like a children's book. It even sounds like a children's book. But there's a strong message here and, if you've discovered the controversy at all, you'll know that message is definitely up for interpretation. Is the story sweet or sad? Is it uplifting or depressing? Some see it as a metaphor of unconditional love. Others see it as a cautionary tale exposing the selfishness and egocentrism of youth. Is the tree a mother, a lover, the environment, or a philosophical ideal? Shel Silverstein's not telling, so you'll have to decide for yourself. If you can't already see that this book is worth a few bucks and a few minutes, then it's not for you. But if you like being challenged and want to read something extraordinary (as in "outside the norm"), then Add to Cart and enjoy. Even if you hate it, you'll love it. One Of THE Best Books To Get The Point Out There! This book has always been one of my favorites. Everytime I'm asked what my favorite book is/was-it's this one. When my son was small, I bought this book to read to him. As he grew up and with my husband as well, I've re-read it to them both, as a reminder that the tree loved the little boy so much, it gave him everything-right down to it's last everything...same as my love for them...the boy got the point in the end, as well as my family. I will always read this book, recoomend it and never forget it--it's his best work in my opinion. While this is just a short, little childrens' book that can be read in five minutes , it's one of the sweetest books you can read. I first read it in a bookstore at the urging of a friend. It brought tears to my eyes, right there in the store. I had to buy it, even though my daughter was only a baby at the time, and we were quite poor. On the surface, the book appear to be about the relationship of a boy and an apple tree. The boy loves the tree and the tree loves the boy. As the boy grows up, the tree (referred to with the female pronoun) always meets his needs, offering herself willingly because of her love for the boy. As for the deeper meaning, it has been the subject of debate. I think it demonstrates the sacrificial love of parents toward their children. Although you could argue that the boy seems to be selfish and unappreciative of all the tree gives him, that is the nature of children. It's also normal for parents to want to provide for their children. It's a poignant, sweet story. 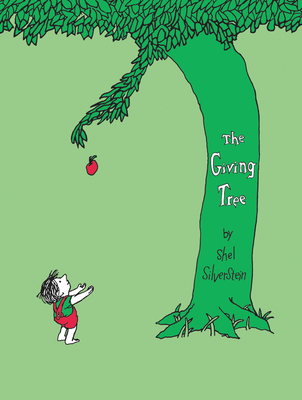 In writing and illustrating The Giving Tree, Shel Silverstein accomplished a masterpiece through the use of unadorned illustrations and descriptive text that requires no interpretation for the reader; thus the moving, unforgetable life lesson is preserved for parents and adults to share with and guide their children for generations to come. The Giving Tree has lived on a bookshelf in my home for over 25 years!